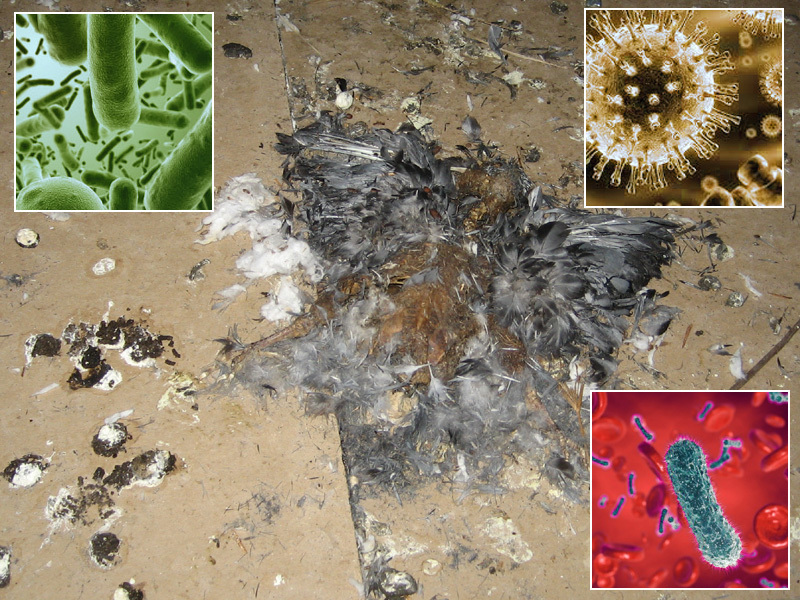 Bird Diseases - There are many issues that come along with a bird problem, but one of the most concerning issues for many people will be the range of diseases and conditions that can be carried and transmitted by many bird species. Many people will refer to pigeons as 'flying rats', and the origin of this negative nickname is not only that pigeons scavenge from human leftovers, but also because they carry a range of diseases that can be transmitted to humans. Another condition worth bearing in mind when looking at bird diseases is influenza, and there are strains of the disease that can be transmitted by birds, which is not only contagious but can be carried over vast distances by birds. A major issue that many people will consider when they find that they have a bird problem is the potential for them or their families to catch avian flu. There have been several scares that this could become a serious issue, and the most recent was with the H5N1 strain of the disease, which is believed to have killed around three hundred people in Asia, Africa and the Middle East. The reality with most bird flu strains is that they haven't adapted particularly well to the human body, so it has only been people coming into close regular contact with birds that have contracted the disease, which is reassuring for most people. There are many diseases that can affect different bird species, but also several diseases that can affect many different bird species. One of the most problematic is Avian Pox, which can be found in many birds, and is quite contagious among different birds, causing warts on the bill, feet and featherless parts of the body, while later stages give the birds breathing problems due to the formation of a plaque on the lungs. Salmonellosis is another disease that can be spread between different bird species, and can often be fatal as it affects the appetite and energy of the bird, with symptoms including swollen eyelids and an unusually thin body. While Avian Flu is certainly the best known disease that can be transmitted to humans, there are a variety of others, and one of the most dangerous is histoplasmosis, which can be caught by inhaling spores that are present in the feces of many birds. Avian Tuberculosis is another condition that humans can catch from birds, also transmitted through the feces, and while weight loss and breathing problems are early symptoms, this can be fatal in some cases. Psittacosis is a variation of the Chlamydia bacteria, and can cause fever, nausea, diarrhea and fatigue in people, while in some cases it can spread to the organs, although it can generally be treated once diagnosed. Zoonotic diseases are not only dangerous to people, but can also be transmitted to pets and other animals, and one of the most dangerous is Cryptococcosis. This can affect the nasal passages and breathing of other animals, and is usually contracted through bird feces, and in some cases can be fatal or cause severe illness in other animals. City Pigeons are often carriers of Chlamydiosis, and has similar symptoms to a person with the disease, namely fever, nausea and diarrhea, among others. How Do Birds Transmit Diseases? The majority of diseases that are transmitted through bird feces, which means that those who are within reach of a gathering point or roosting spot for birds can often come into contact with avian diseases without even coming into contact with the birds themselves. This is not to say that the birds themselves don't carry diseases, as a scratch or peck from a bird can transmit diseases, while contaminated food or water can also be an issue. This is particularly a problem in areas where the water supply is open, such as in a large container, or where birds can congregate and transmit diseases to other birds, such as around bird baths and feeders. When it comes to dealing with a bird problem or going into an area where there is likely to be a significant population of birds in a confined space, it can be wise to take certain precautions to try and avoid contracting any of these bird diseases. Where you come into contact with bird feces, long sleeved clothing and gloves will help prevent direct contact, while a breathing mask and goggles will help you avoid conditions such as histoplasmosis transmitted through the feces. If you are having to handle or deal with trapped birds, make sure you wear thick gloves that will resist a peck from a sharp beak, while moving birds in cages is often much easier if you put a blanket or thick towel over the cage itself. Go back to the main Pigeon and Bird Removal page for more information about bird disease, and which ones humans can get, or pets such as cats or dogs.